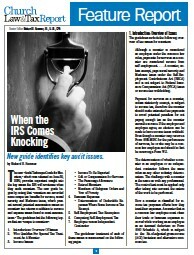 The new "Audit Technique Guide for Ministers," provides important insight into the key issues the IRS will scrutinize when they audit ministers. The new guide begins by noting that "ministers are accorded some unique tax benefits for income, social security and Medicare taxes, which present several potential examination issues on ministers’ tax returns in addition to income and expense issues found in most examinations." The guidelines' treatment of each of these issues is summarized in this Feature Report.